"Malcolm Harris's debut is a feat of interpretation. He takes the cultural and social hallmarks of Millennials and helps us understand them as symptoms of an unfolding crisis. Essential reading for any person born in the 1980s or '90s who has internalized the deteriorating conditions under which they came of age, and an antidote to every insipid think piece sold to older people trying to figure out what the hell is wrong with us." Section New Hardcover - Nonfiction / Sociology / All Staff Suggestions / Non-Fiction Suggestions / Nick S.
"The first major accounting of the millennial generation written by someone who belongs to it." - Jia Tolentino, The New Yorker "A landmark." - n+1 "The best, most comprehensive work of social and economic analysis about our benighted generation." -Tony Tulathimutte, author of Private Citizens "The kind of brilliantly simple idea that instantly clarifies an entire area of culture. "-William Deresiewicz, author of Excellent Sheep Millennials have been stereotyped as lazy, entitled, narcissistic, and immature. We've gotten so used to sloppy generational analysis filled with dumb clichés about young people that we've lost sight of what really unites Millennials. Namely: - We are the most educated and hard-working generation in American history. - We poured historic and insane amounts of time and money into preparing ourselves for the 21st century labor market. - We have been taught to consider working for free (homework, internships) a privilege for our own benefit. - We are poorer, more medicated, and more precariously employed than our parents, grandparents, even our great grandparents, with less of a social safety net to boot. Kids These Days, is about why. In brilliant, crackling prose, early Wall Street occupier Malcolm Harris gets mercilessly real about our maligned birth cohort. Examining trends like runaway student debt, the rise of the intern, mass incarceration, social media, and more, Harris gives us a portrait of what it means to be young in America today that will wake you up and piss you off. 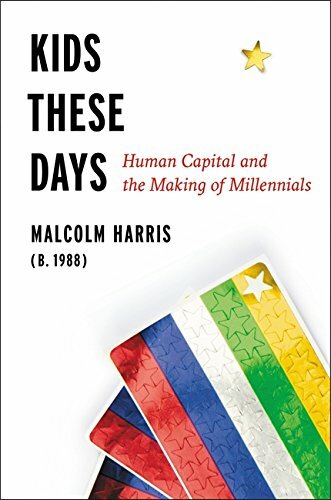 Millennials were the first generation raised explicitly as investments, Harris argues, and in Kids These Days he dares us to confront and take charge of the consequences now that we are grown up.